For most activities, music plays an important role. Whether you’re trying to make chores more exciting by blasting your favorites tunes, entertain yourself on a long flight or car ride or are setting out on a long run, music tends to play the role of entertainer or therapist to help you focus and better enjoy yourself. But, it’s the thought of how music can adapt to a more central role during activities that a new music start-up wants to explore. Imagine if music understood your movements, heartbeat and energy levels and could tailor itself to play in sync with your body. Weav Music seeks to make music more adaptive, both for those participating in exercise and the music creators themselves. The company has developed a new music engine that essentially allows artists to manipulate their song and adjust the tempo based on what the listener is doing. Not only does this allow the artist to create multiple versions of their song, but also it allows the musician to consider that people listen to music differently while doing different activities. It sounds complicated, impressive and monumental-and that’s because, well, it is. Lars Rasmussen is no stranger to big ideas and being an entrepreneur. Rasmussen is the co-creator of Where 2 Technologies, a mapping start-up that was purchased by Google, later becoming Google Maps. Rasmussen recently worked as the Engineering Director at Facebook-the job he left in order to pursue Weav alongside his partner and co-founder, Elomida Visviki. What started as a hobby project turned into both Rasmussen and Visviki leaving their jobs in 2015 to work on Weav full-time. Two and a half years later, they are a team of five employees who are software engineers, designers and music engineers. Rasmussen is aware that using technology to change the tempo of music is not a new idea. Most technology focuses on stretching out the time, which leads to a horrible sound quality and a “chipmunk” sound effect because a computer is simply stretching out the song to try and make it faster. This is where Weav is different. Unlike other formats, they are putting the musician in control of the composition to determine how the track should change based on the speed chosen by the listener. “It’s not a new idea, but what’s different is that this is an idea whose time has come,” Rasmussen explains, who notes that we now have phones in our pockets that carry sensors that can measure how far we’ve walked, how fast we’re moving and how fast our heart is beating. Sensors are fairly new, but Rasmussen says they are the key to making this adaptive music technology work. 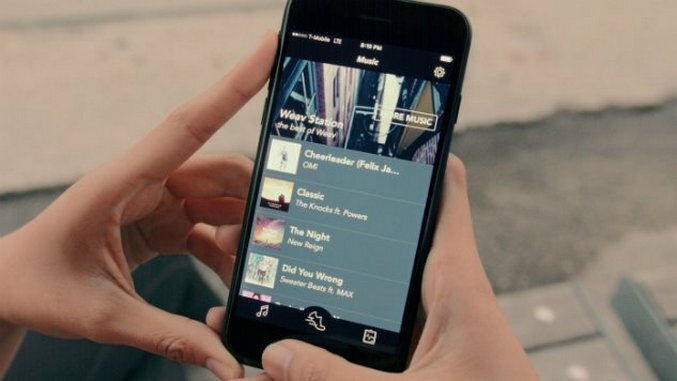 With the use of sensors, users can listen to a song and say, “Hey, I want this to be faster.” Because of that, Rasmussen explains there is a mass-market appeal for the ability to change the tempo of music, -which wasn’t the case years ago; hence no one has been successful in this space yet. So how exactly does this technology work? It’s adaptive music, meaning artists can make music that can change. The listener can pick the tempo, energy level or mood and the song will adapt based on what you choose. It’s as if the band or artist is playing the song just for you and what you’re currently doing. Weav created a running app called Weav Run to demo one way in which music can be adaptive using their tool. When running with the app, your phone detects your speed and the song playing will adapt to your tempo. If you’re running slowly, the song will slow down and play in sync with your tempo. If you start running faster, the song will speed up and sound similar to a dub-step remix, as opposed to a chorus of chipmunks. Visviki explains the process of music becoming adaptive as similar to following a recipe using the original stems from a music track. Each track is like a recipe and they have to get the exact quantities needed to create the track. The hardest part is also the most important-getting the stems of the original music, which requires working with labels to clear the rights for use. Despite this hurdle, Weav is already building a large library of songs, with most of the current music selections being local bands and lesser-known artists, which isn’t a bad thing. Even though there won’t be very much music in the app right now and you won’t be able to use it to listen to your favorite, popular songs, Weav wants you to focus more on the joy of music being there to help with your goals. Rather than running to music you recognize, the app wants to help you feel good by getting your body in sync with the music. “People who have used the app are telling us that they feel better and can run faster because it feels so good to be in sync with the music,” Visviki says. For now, Weav Run is just one example of many ways Weav plans to use and demo its technology. In addition to the running app, they offer software called “Weav Mixer,” the tool for musicians that allow them to create tracks by “weaving” adaptive music. Artists interested in testing the software can sign up for their beta version. Developers can also gain access to the technology to embed interactive music in their apps.